precipitation ranges from 12 inches to 40 inches a year. Sagebrush grows in dry places where other plants do not, but it prefers well drained soils in sheltered areas. The sagebrush is a perennial shrub with straight, stiff stems. Sagebrush can grow to be 2 to 12 feet tall. The leaves are 1/2 to 1 1/2 inches long, have a ragged three-toothed edge ("tridentata" means "three-toothed"), grow close together, and are greenish. The actual plant is silvery-grey and roundish. It has small white or yellow flowers that grow close together in groups called florets. The sagebrush produces seeds. This plant is deciduous. The sagebrush has a strong sweet smell and a bitter taste. it has shallow roots that are spread out below the surface to absorb the water. When it is very dry sagebrush can still be living, but look dead. When this happens it can get uprooted and spread its seeds when blown by the wind. Sagebrush is used by Native Americans as a smudge herb (an herb burnt for the smell). It is picked along with juniper, chaparral, desert tea and other herbs. When its leaves are powdered they can be used for rashes such as diaper rash. Its decoction, which is the water that it has been boiled in, can be used on bitten and irritated skin. 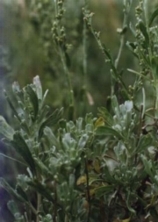 The sagebrush's smoke is offensive to many animals and insects and helps keep mosquitoes away. When wrapped around perishable food it will keep insects and rodents away. Some livestock and wildlife animals that eat this plant are: cattle, domestic sheep, horses, pronghorn, elk, mule deer, white-tailed deer, small mammals, small non-game birds, upland game birds, and waterfowl. Sagebrush is on no endangered species list, but doesn't grow in as many areas it used to. This is because people have been planting other plants that can come back after a fire, which it can't. W., Monroe. "Sagebrush". The World Book Multimedia Encyclopedia Chicago, IL: World Book, Inc. (2000). "Sagebrush" http://www.encyclopedia.com/articles/11309.html. (November 3, 2001). "Sagebrush". Encyclopedia Briticana Inc. Chicago, IL (1998). Reader's Digest North American Wildlife: Trees and Non Flowering Plants. Pleasantville, NY: The Reader's Digest Association, Inc. (1998).